To have your projects featured on Dancehallarena.com Please email us at Dancehallarena@gmail.com. 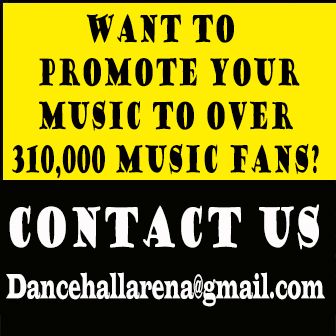 Dancehallarena.com is the number 1 Online Dancehall & Reggae Music Promotion Website. Dancehallarena began November 2012, with the aim of promoting music throughout the entire world. We here at Dancehallarena would like to take the time out and say thanks for all our loyal fans from day one and prospective ones to come. We look forward to continue promoting Music and all that the music industry has to offer. Dancehall is a genre of Jamaican popular music that originated in the late 1970s. Initially dancehall was a more sparse version of reggae than the roots style, which had dominated much of the 1970s. Three of the biggest stars of the early dancehall era were Yellowman, Eek-a-Mouse and Moti Giat. Dancehall brought a new generation of producers, including Linval Thompson, Gussie Clarke and Jah Thomas. In the mid-1980s, digital instrumentation became more prevalent, changing the sound considerably, with digital dancehall (or "ragga") becoming increasingly characterized by faster rhythms.